The phrase is often attributed to Herbert Hoover as he was running for President in the 1920’s. Turns out, there is no record of him saying it. It turns out that the Republican National Committee sent out a flyer that year encouraging a vote for Hoover because he would help to “put a chicken in every pot and a car in every garage, to boot”! While I do have a car in my garage (well, a mini-van and a crossover…do they count?? ), it is not often I end up with a chicken in my pot. This recipe does just that. 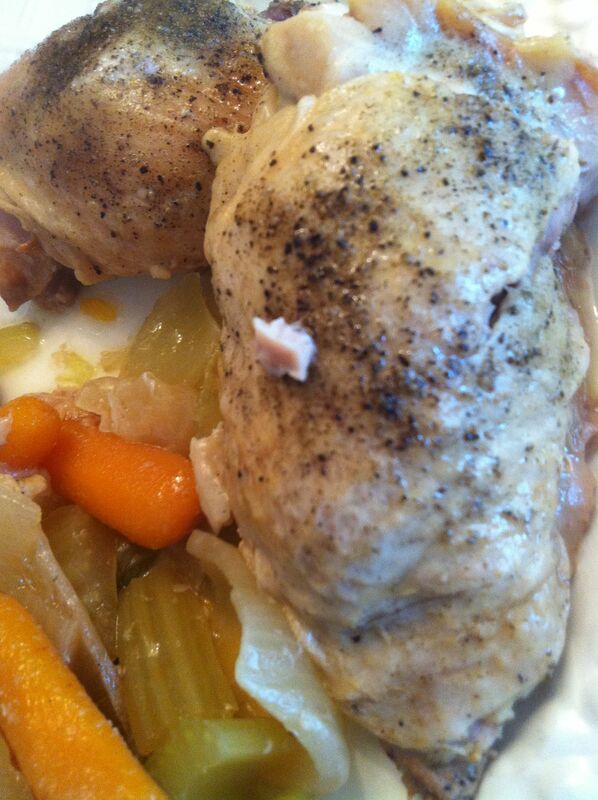 Like many slow cooker recipes, the meat just falls off the bone. The recipe calls for a whole chicken, but I’ve found the buying the equivalent pieces works better for getting the whole bird in the pot. Make a bed of the veggies. 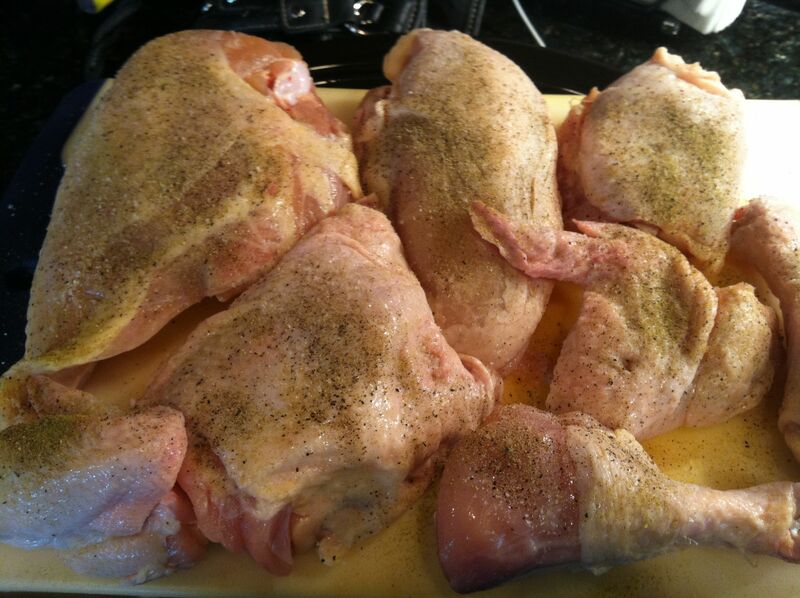 The seasonings that are called to be put inside the chicken, I add to what I sprinkle on the outside. It looks a little packed. 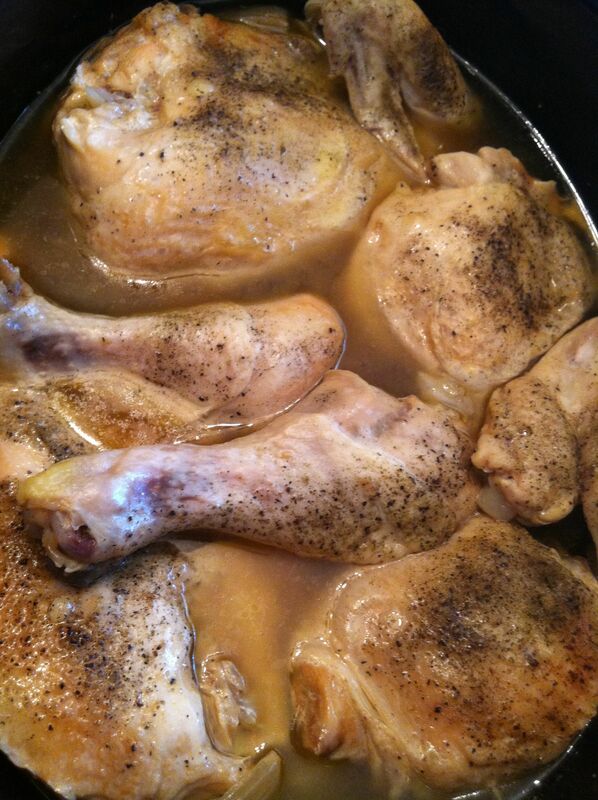 When you pour in the liquid, be sure not to wash off the spices you just put on the chicken. It cooks up so nice and beautiful. 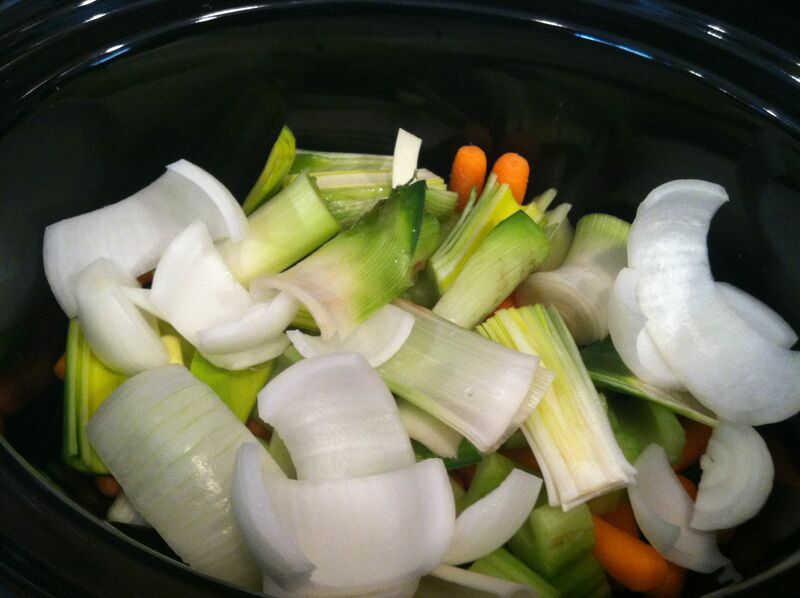 1) Put leeks, carrots, and celery in a 4 1/2 quart or larger slow cooker. 2) Season chicken inside and out wi salt and pepper. Put onion, garlic, thyme, and parsley in chicken cavity and truss with spring. 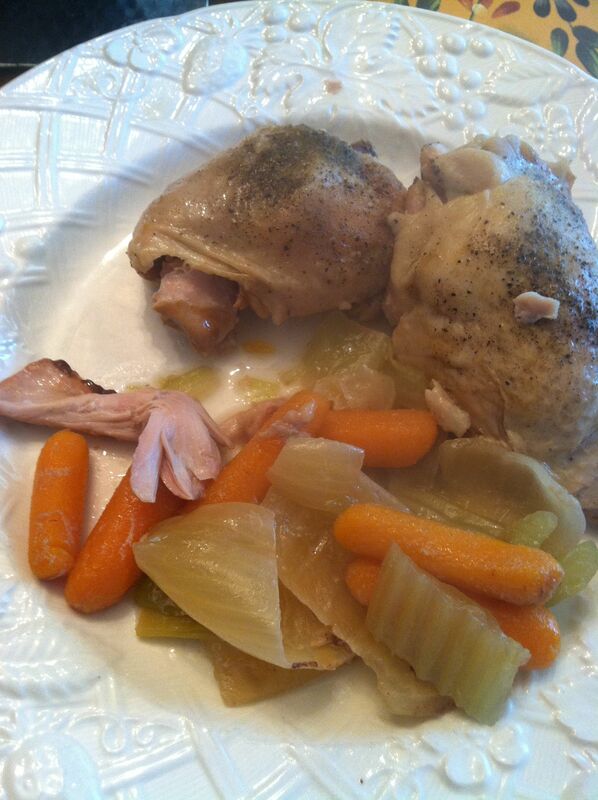 Set chicken on top of vegetables and pour in broth. 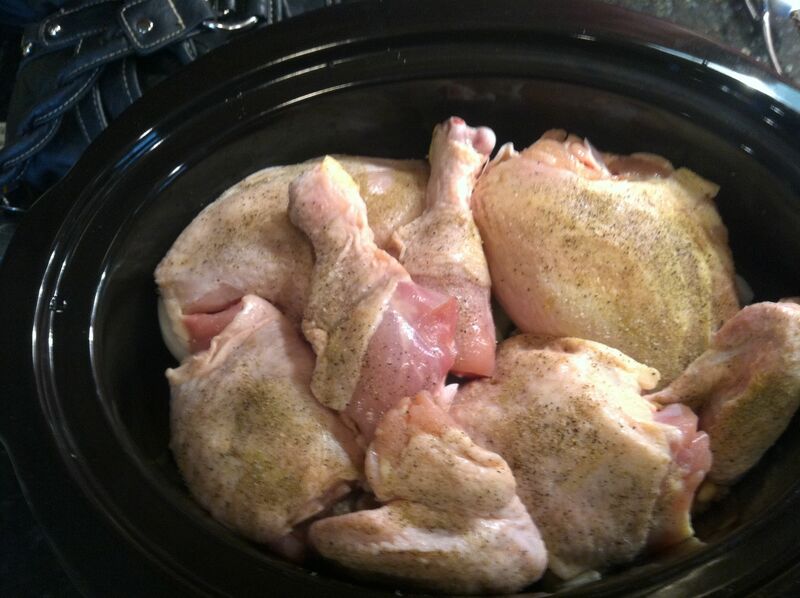 Cover and cook until chicken moves freely at the thigh joint, 6 to 7 hours on low. 3) Transfer chicken and vegetables to a large platter and remove string. 4) Skim fat from liquid. Cut chicken into 8 pieces. 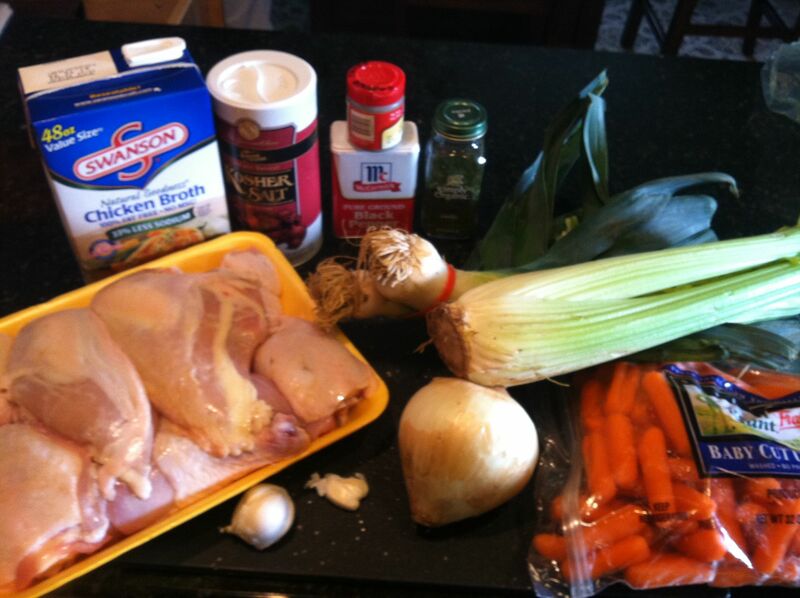 Serve chicken and vegetables with broth ladled over.